What would happen if bicycle usage increased by 10%? What would happen if more people would use their bicycle instead of using their car? What would happen if cycle use in a midsized Dutch city, like Alkmaar, were to increase 10%? Fietsberaad, the Dutch cycling knowledge center, used advanced models in search of these effects and issued a publication named “Sensitivity analysis effects of cycling policy, Effects of increasing bicycle use for a midsized city for accessibility, air quality and health.” We have made a summary. In the research Fietsberaad surveyed 10 different possible effects related to: health, safety, air quality, parking and traffic. In 9 out of the 10 of the surveyed issues, the increase of bicycle use would have substantial to enormous positive effects. Traffic related issues, including loss of time for car drivers and parking problems have shown the most profit in the study. However smaller profits related to the other problems are also substantial, since they tend to affect a larger group of people. It would be interesting to compare the costs and benefits of a good cycling policy with that of other measures, for instance in its ability to stimulate exercise. Besides this, a good cycling policy should have small costs when combined with price incentives, for example parking fees and toll measures for cars. There is another important footnote. Most of the calculated effects will only happen if a majority of the new cycle users comes from the previous car users. 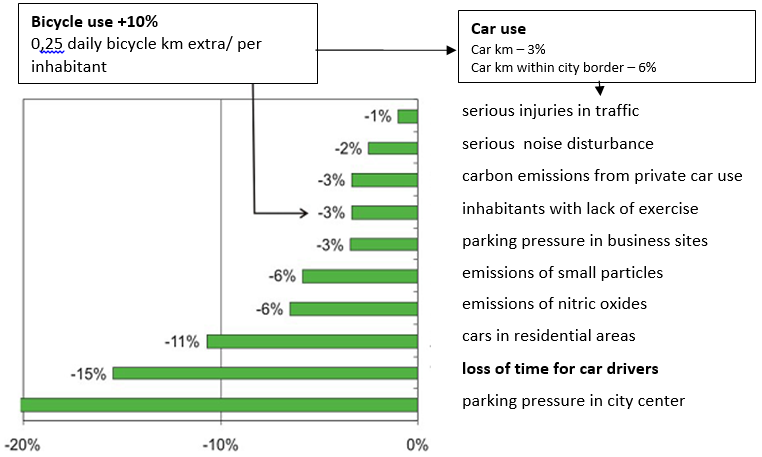 This survey assumes that 10% more cycling will lead to 3% less kilometers being traveled by car (6% less kilometers within the city boundaries). If not, the only issues addressed will be related to exercise levels in the overall population. Nevertheless, most people would be happy to have better cycling infrastructure, in order to move around more safe and freely in their town. The quality of accessibility in a town is usually counted in loss of time for car drivers. 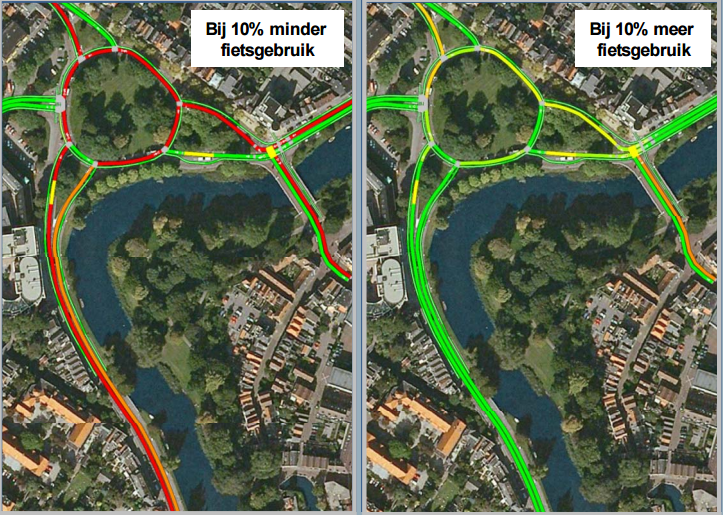 The traffic models predict an explosive growth of time loss in Alkmaar, caused by autonomous developments. In 2020 the road network will likely be heavily overloaded during a great part of the day. This is why the effect of 10% more bike usage would have such an impact on the loss of time for car drivers. Furthermore the loss of time per car-movement could decrease by 15%. This will lead to a better flow on main routes within the city, and on the city’s ring road there would also be a robust diminishing in lost hours. Not examined in the report are the profits for cyclists and bus passengers. However, measures such as the different timings of traffic lights (shorter red lights) can be profitable for all road users. Looking at what monetary profits could be made from this. A 10% increase of cycle use during the Alkmaar rush hour would save between 3 and 6 million euros a year. Summed up for all mid-sizes cities in the Netherlands, it could save 160 to 360 million euros a year. Unfortunately these profits would mainly benefit the still driving car users, and not the new cyclists, nor the city responsible for the investment. However car users profit about 1 to 2 cents/km or 7 to 14 cents/ride. Therefore it is reasonable to assume that car users lose their profit by having to pay for parking or by other costs. Fietsberaad indicates that this survey is meant for a growing insight, not for a definitive conclusion. The study doesn’t answer how to increase to 10% more cycle rides. Good cycling policy combines smaller and bigger measures. 10% growth is not an impossible goal, there is already a huge growth in several Dutch cities, but there is also a large difference between Dutch cities. In order to guarantee that a growth in cycling comes together with the decrease of car usage, you need a good mix of push and pull measures (also called carrot and stick). The ‘carrot’ can be good cycle paths and free cycle parking, to encourage people to start and to continue cycling. This does not only encourage car users, but also bus passengers. This ‘carrot’ can in turn create new consequences. It would be good for the health for the people who choose to use it. But it could also become a problem for accessibility, since more people who would not normally travel could also choose to use the bike lanes. A ‘Stick’ is more effective in order to stimulate the step from car usage to bicycle. The Dutch National Office for Environment calculated that parking and toll fees, could lead to 10% increase in cycling. Paradoxically a better flow for cars could also attract new car drivers. Calculating this “latent demand” is far too complex for most models. Therefore this effect isn’t accounted for in most studies. Pricing could avoid this, likewise measures that make the travel time for car drivers longer, like cutting routes in the inner city, or choice to only make room for regional or business traffic.